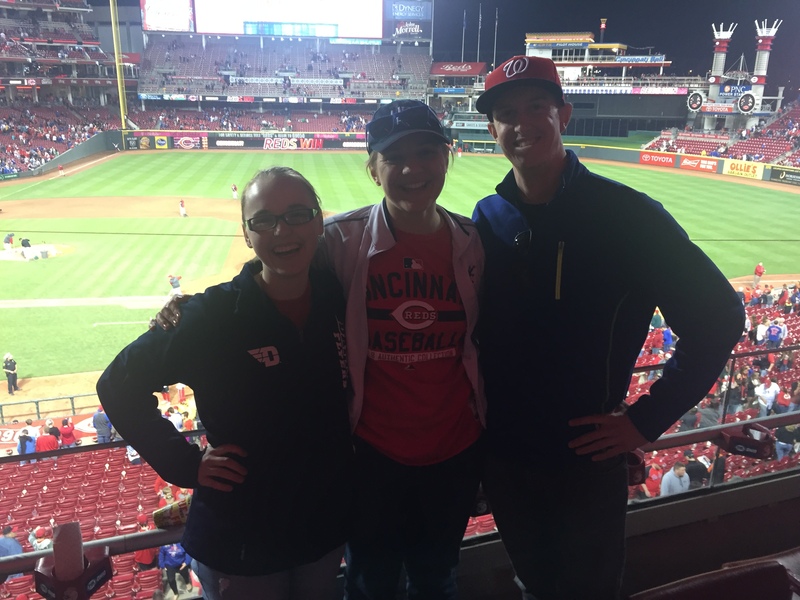 It was the second annual (hopefully it’s annual) installment of me asking my friend Emily to ask her mom for her company’s fancy-schmancy Reds tickets…and me tagging along with an assortment of other friends for an evening full of food baseball, and (two-for-two so far) a Reds win. Luckily, one of the assorted friends this time was Paul, who conveniently attends college at Xavier University in Cincinnati. 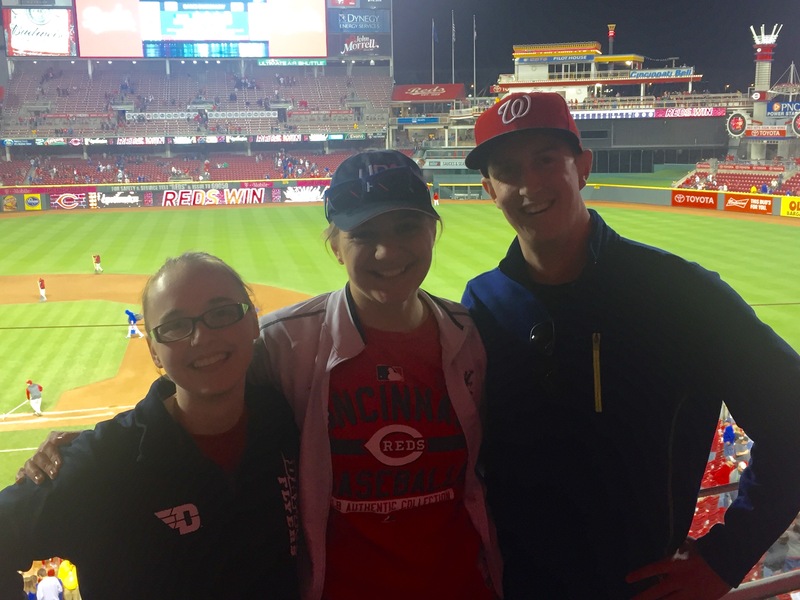 Saturday pitted the Reds against the Cubs for the sixth time in 2016. 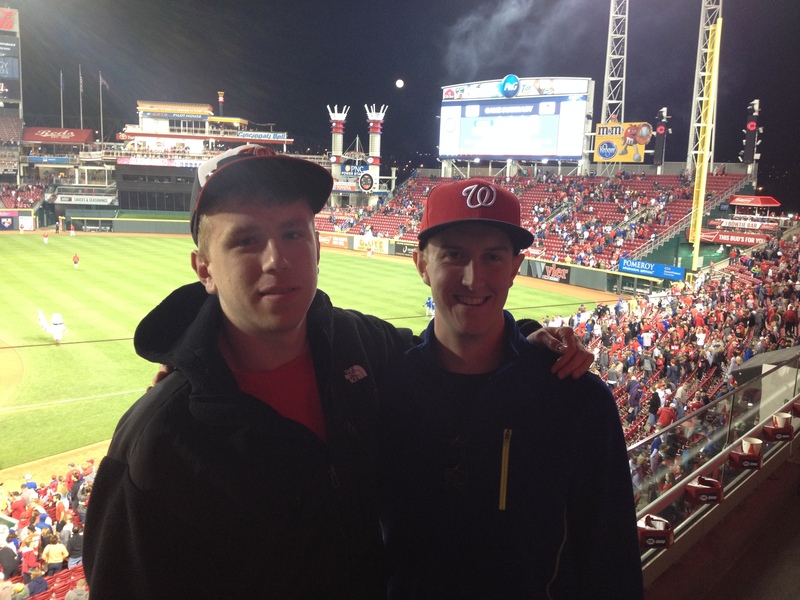 The Redlegs were a goose egg for the first five. In fact, they had been no-hit two nights prior by Jake Arrieta. 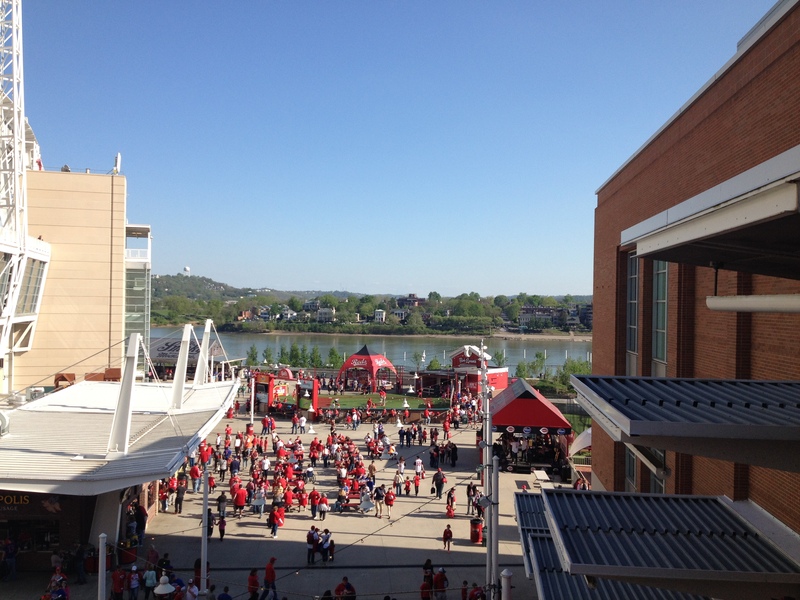 It was also Joey Votto bobblehead night at Great American Ball Park. If you add all those things up, you get long lines, lots of kids, and way too many Votto and Kris Bryant shirseys for my eyes to count. It was a shame for everybody involved that the Cubs didn’t take batting practice at all. As we walked into the stadium, the batting shell was being rolled away, and some Chicago players were out throwing in left field. But there was no hitting to be had. So naturally we ascended to the posh club level perch, complete with a smorgasbord (which I really think should be spelled “schmorgizboard” for the fun and Scrabble-value of it) of ballpark and non-traditional ballpark cuisine. I had an approximately eight course meal before first pitch. I actually had to schlep down and out of the stadium to give Paul his ticket when he arrived, which was an adventure of its own. 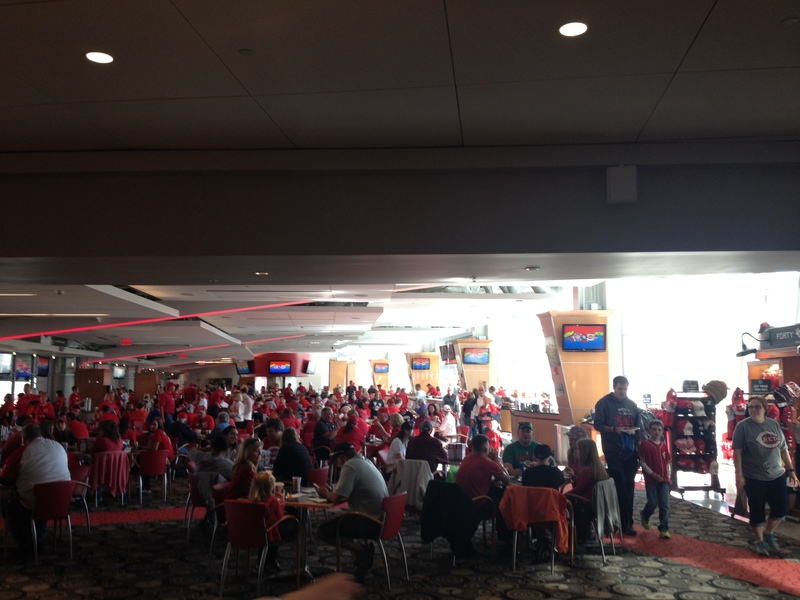 The Reds conveniently have a re-entry gate, but as I learned from a pair of far-gone, alcoholically-inebriated Cubs fans on my way back in, people entering the stadium for the first time cannot use the same gate as those re-entering. While I’m on the subject of drunk people: MLB instituted cheap little metal detectors at each stadium last year that fans must pass through upon entering. The security process is this: hand off a bag (if you have one) to the yellow-shirted guy, and put your keys and cell phone in a little container. The bag is inspected and your items are passed around the metal detector while you walk through. And that’s it. Hardly TSA. Well, there was this one rather indulgent fan who in his state of mind treated the line as though he were hitching a flight on Jet Blue (Moon), and took his shoes and belt off in line. The security guard informed him there was no need of that and he seemed absolutely baffled by the fact that he could be passed off as safe without being forced to strip his accessories. Anyway, after he re-clothed, he took a selfie with a statue of the Reds’ mascot and went on his way. It was the bottom of the first by the time Paul and I made it back up to our section and he had successfully loaded his arms and hands with the various delicacies his mouth desired. Our seats were in the first row of section 303, the second deck right above first base. I think it’s slightly higher than the Stars & Stripes Club is at Nationals Park, but it’s still definitely within foul ball range, as we learned in the later innings. I mentioned to Paul though that given our limited lateral mobility (we were stuck in the middle of the row), our foul ball snagging chances would be at a minimum. In the top of the second, Addison Russell jacked a solo home run into the second deck in left field, temporarily putting the Cubs up 1-0. In the bottom of the fourth, Brandon Phillips knocked in a run to put the Reds up 2-1 with a double-almost-triple to the wall in left-center. He was thrown out at third base by a hair. Chicago re-took the lead in the fifth by putting up two runs, but the Reds’ bats went on a rampage in the bottom of the sixth. Eugenio Suarez and Adam Duvall both hit three-run homers. Duvall’s was followed up by a Scott Schebler dinger, and the Reds had seven runs in the inning. Also, Tyler Holt pinch hit in the inning, and actually came around to bat a second time before three outs were recorded. So I guess that’s technically two pinch hit appearances in one inning/game. He singled on his first one. The Reds weren’t done as they tacked on two more runs in both the seventh and eighth innings. Superhero bobblehead man Joey Votto (Vottomatic) homered in the bottom of the seventh–a two run shot to right field. 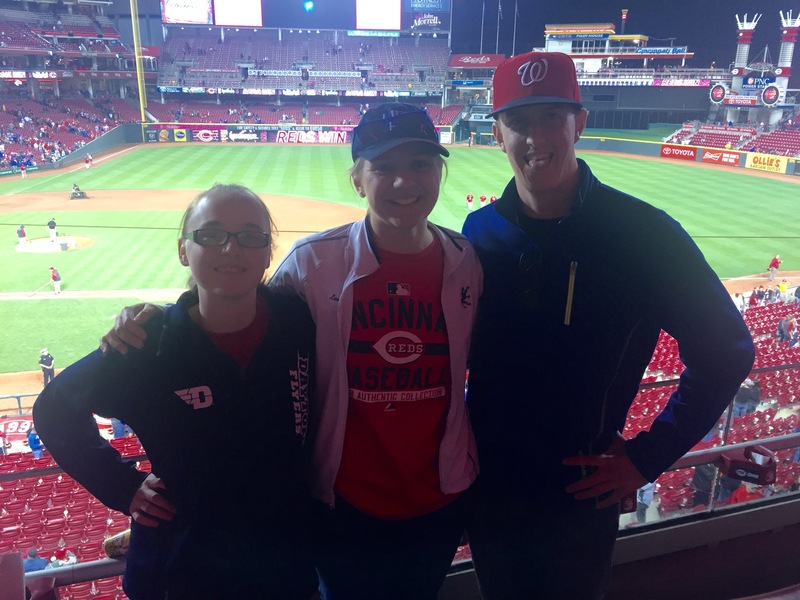 It was Cincinnati’s fourth homer of the day and the fifth altogether between the two teams. Miraculously, it was the only one I missed–an 80% success rate. Hear that, dad? I was getting food at the time and happened to catch it on the television screens inside, but didn’t see it in person. Still though, four out of five. That’s…something. 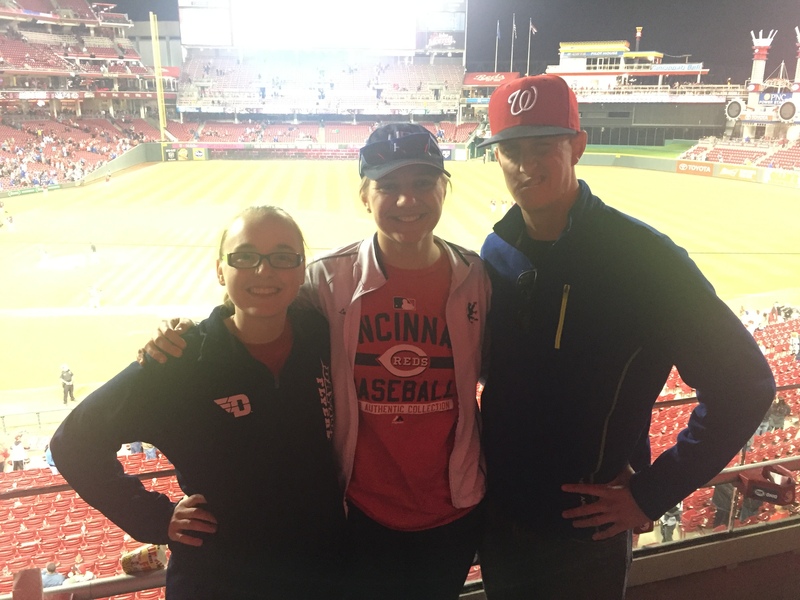 As for the foul balls: I wasn’t wearing my glove because none came to our section last year when I was there and none appeared during the first several innings this go-around. But in the seventh, a righty popped one up right towards us. I yelled at Paul because he was on his phone, and we both stood up. But the ball descended two rows back and was pretty much uncatchable without me stepping over the people sitting behind us. I had learned my lesson though, so I put my glove on and waited for another. The opportunity came on a silver platter, but I made like the Bengals and let the moment gobble me up. The row behind us was empty, and Paul was sitting to my left. To my right were my friends Heather and Emily, neither of which are experienced in the foul ball catching department. Paul was on his phone AGAIN as a right-handed batter hit one straight to us. I stood up and tried to shift to my right, in line with the ball, but Heather’s femurs were impeding my path. Kids: this is why you don’t want to make friends. She was yelling at me like she wanted me to catch it, which she did (and I did, too…duh), but we both froze up and didn’t move. I could have/should have stepped over my seat to move to the empty row behind us, but I didn’t think fast enough and the ball landed on some deserted concrete and bounced away to a fan sitting in our row to the right. It was a bummer, but I’m sure there will be more opportunities in the future. 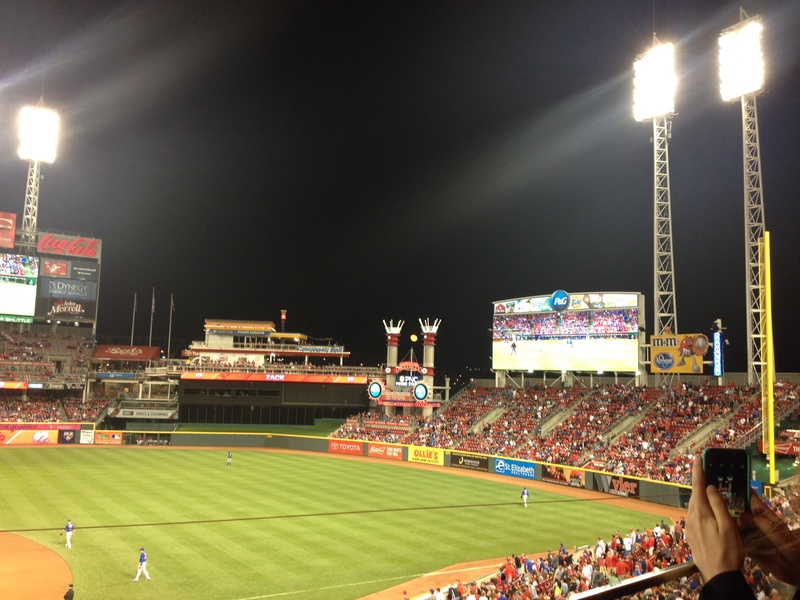 The Reds won 13-5. The 18 combined runs were the most I had ever seen in a game in person. 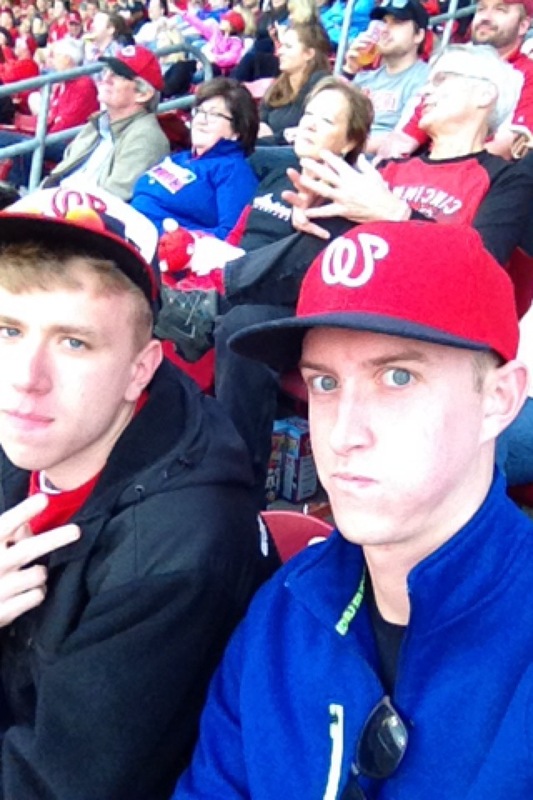 Defeating the 16 I saw at Nationals Park in September 2012. 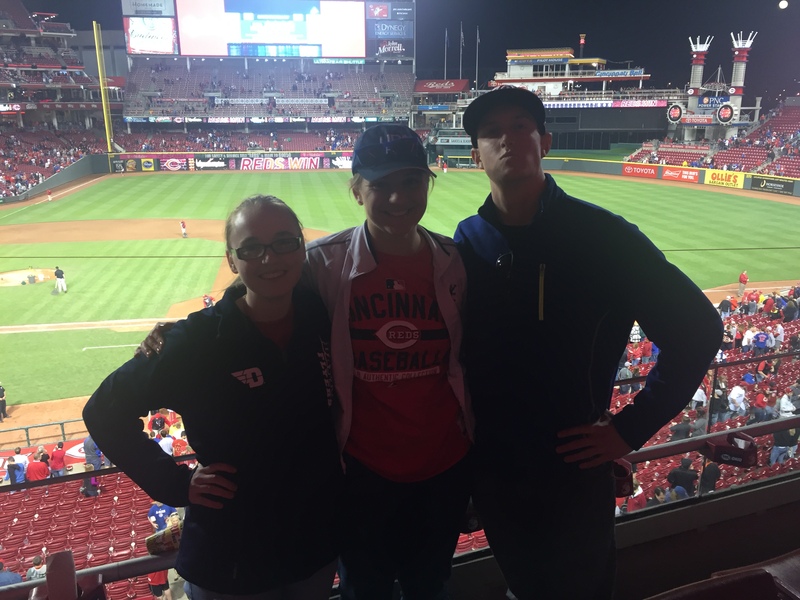 Overall, it was a really fun time and I highly recommend the all-you-can-eat seats at Great American Ball Park should you be so fortunate enough to have a friend with connections. Next stop on my baseball adventures: home. And Nationals Park in May. Peace out. 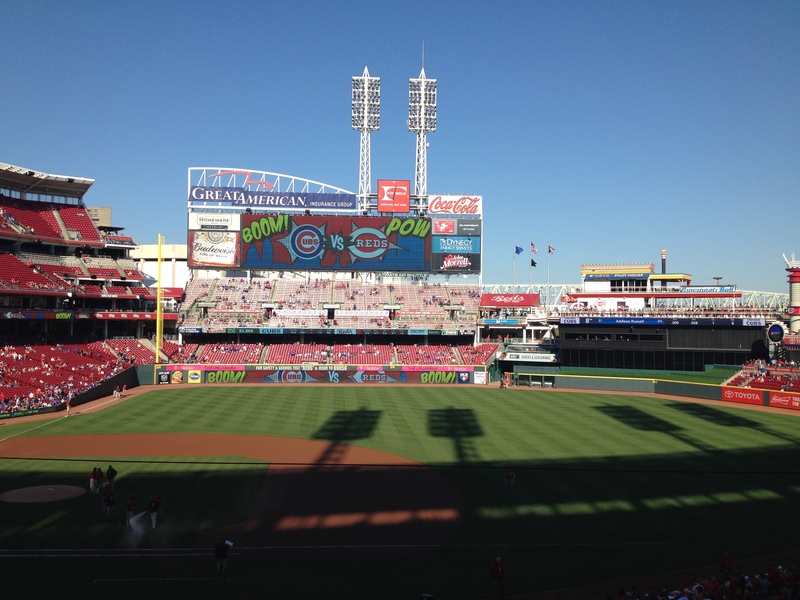 I’ll be headed to GABP in June when the Cubs are there….. Hoping they actually hit BP….